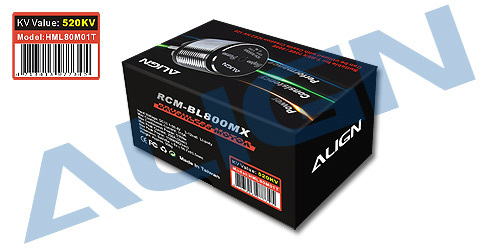 ●To meet the power and torque requirements of enthusiasts, the high output 800MX motor was born in Align’s R&D lab. With dramatic increase in torque and power output, capable of 5100 watts continuous power output and 11000 watts of burst power! ●800MX features high efficiency, superior power, excellent torque, low current draw and low temperature; it’s capable of maintaining consistent torque and head speed through continuous 3D maneuvers. ●Due to the 800MX’s high efficiency and low current draw, the standard equipment 120A electronic speed controller are sufficient to experience the power of this motor, and extend battery longevity. ●800MX motor incorporates radial fan in its end bell, creating powerful airflow to dissipate heat. Tweaks to motor design and reduction in weight not only contributes to dramatic power increase, the high efficiency cooling system enables cooler operating temperature during and after flights when compared to motor of previous generation. 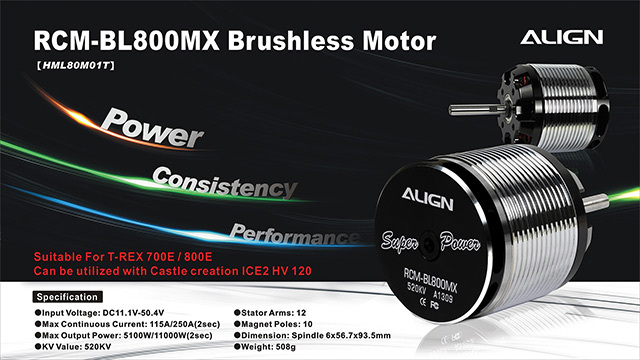 ●The 800MX motor armature are dynamically balanced to eliminate typical imbalance found in other outrunner motors. ●Maintenance free、high torque、high efficiency、stable, and low noise. 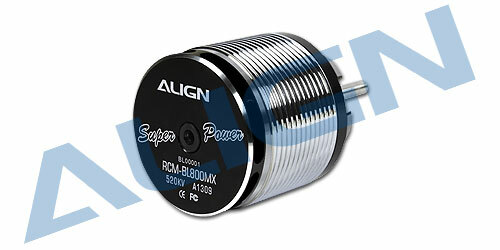 ●High-speed ball bearings, powerful magnetic outrunner rotor. ●Suitable for T-REX 700E 、T-REX800E helicopters. 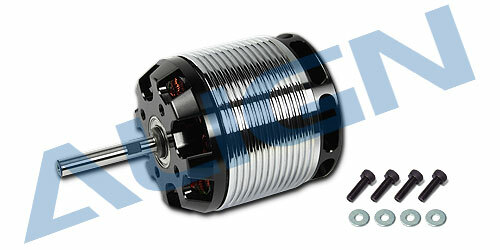 800MX(520KV) motor is suitable for use with speed governor function on the speed controller. Start with setting the governor so that head speed is at around 2200RPM, and adjust according to individual needs. For safety reasons, please do not set too high of head speed. Effective immediately, the Align MX series motors have 50% off Lifetime service where your old motor can be exchanged for 50% off the retail pricing of a new equal spec motor. If needed, please contact to Align authorized distributors .